Spear-bots are enemies encountered in Wario Land 3. They seem to be related to the similar-looking (but much larger) Hammer-bots, and a fire-wielding variety of them exists. (This variety can turn Wario into Flaming Wario.) Yet another variation exists that emits blades so sharp that they can cut Wario in half. 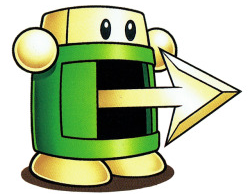 Spear-bots are very similar to Spearheads, who also use "spears" to harm Wario. However, Spear-bots don't always have their spears out to be touched; they store them in their chests when they are not in use. Unfortunately for Wario, though, these spears are revealed when a Spear-bot spots an opponent. Spear-bot also charges in the direction of any nearby opponent, making them a somewhat challenging enemy for Wario to overcome. Wario Land 3's manual gives Spear-bot a bit of a personality. The manual reveals that he has a rivalry with Spearhead (although it is unknown if this grudge is requited), and it also suggests that Spear-bot is a firm believer in the idea that mechanical beings are superior to organic ones. Finally, the manual states that Spear-bot is mass produced, although it is unknown where. ↑ Wario Land 3 English instruction booklet, pg. 27. ↑ Wario Land 3: Fushigi na Orgel Japanese instruction booklet, pg. 27. This page was last edited on March 12, 2018, at 15:56.